Data released for the first time by the U.S. Department of Education Office for Civil Rights have revealed a severe crisis — 6.5 million students, including millions of low-income children, are frequently absent, missing three weeks or more of school each year. According to A First Look: Key Data Highlights on Equity and Opportunity Gaps in Our Nation’s Public Schools, 13 percent of America’s 50 million K-12 students were “chronically absent” in 2013–2014. In many cities, more than 30 percent of students miss three or more weeks of school in a single year, including Boston, Columbus, Detroit, Philadelphia, Providence and Washington D.C. — all places served by City Year AmeriCorps members. Simply put, students have to be present and engaged in their learning if they are going to succeed. Our district and school partners across the country recognize that efforts to improve instruction and classroom environment will fall short if students are not in school. Until we work together to not only tackle chronic absenteeism but also ensure that all students — regardless of race, socio-economic status or zip code — have access to developmental relationships with caring adults who inspire them to come to school regularly, and receive appropriate academic and social-emotional supports that help them to flourish, unacceptable achievement gaps will persist and school improvement efforts will be hobbled. This new data propels us to redouble our efforts, working alongside our partners to more powerfully engage students and families and sharing solutions more widely. 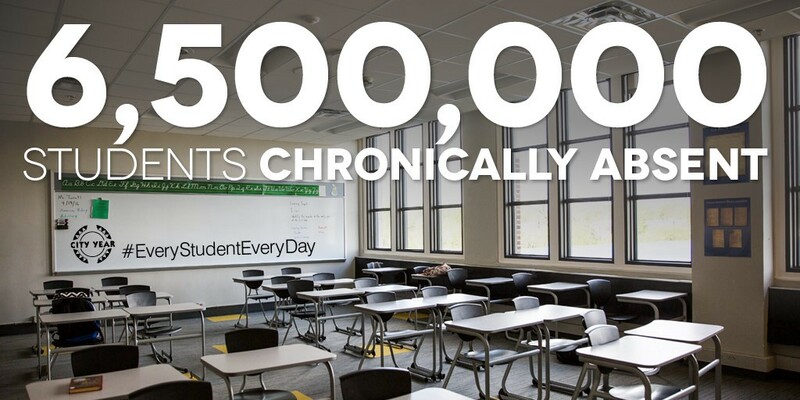 In the schools City Year serves, many students need additional support to get to school every day ready to learn. Each morning, AmeriCorps members greet students as they arrive to school. When students are absent, corps members reach out to check in with families and encourage students to get to school. They lead morning meetings, tutor students one-on-one, provide small-group instruction during the school day and run extended day programs before and after school. These activities allow AmeriCorps members, who are near-peer — older than the students they serve, yet young enough to relate to the students’ perspective — to interact with students in a variety of settings and to provide them with additional positive relationships. Corps members learn about student’s lives in and out of school and can collaborate with educators to pinpoint solutions related factors that might be affecting their attendance. Working full-time alongside classroom teachers in high-need urban schools, City Year’s 3,100 AmeriCorps members use a data-driven approach designed to ensure that students who are at risk of falling off-track receive additional academic and social emotional supports and interventions to help them succeed. In particular, they are trained to work with students who exhibit one or more of the “early warning indicators” for dropping out of school: issues with attendance, behavior or course performance. Their work is having an impact. Last year, City Year AmeriCorps members helped to drive a 36 percent reduction in students who are chronically absent in middle and high schools we serve across the country. This is challenging work that requires creative cross-sector solutions. City Year is a part of national collaborations that include school districts and educators and are designed to dramatically reduce chronic absenteeism and strengthen the nation’s urban graduation pipeline. One example is Diplomas Now, an innovative partnership with Johns Hopkins University’s Talent Development Secondary and Communities in Schools, which provides additional resources to high-need urban schools. Diplomas Now received a competitive federal i3 “Investing in Innovation” grant to conduct one of the largest randomized control trials of U.S. secondary schools. A recent report on the multi-year intervention found “positive and statistically significant” impact on reducing chronic absenteeism in the key sixth grade middle school transition year and identifying students who were most at risk for dropping out and helping them to stay in school and get back on track. City Year also collaborated with Johns Hopkins University, the U.S. Department of Education, Attendance Works, MENTOR, the White House, and other groups to help pilot and design the My Brother’s Keeper Success Mentors Initiative, which is aimed at reducing chronic absenteeism and improving outcomes for young people in high- need communities. City Year partners with schools in 28 cities nationwide, including several of the cities participating in My Brother’s Keeper Success Mentors (Boston, Cleveland, Columbus, Dallas, Denver, Detroit, Jacksonville, Miami, Milwaukee, New York, Orlando, Philadelphia, Providence, Sacramento, San Antonio and Seattle). Education Secretary John B. King Jr. called the data on chronic absenteeism “a call to action to do better and close achievement and opportunity gaps” for students. City Year agrees and is fully committed to ensuring that every student comes to school every day, so they can gain skills, thrive academically and graduate from high school, prepared for success in college and career. President of @CityYear - Committed to addressing the urban #education challenge and ensuring that all children meet their potential.